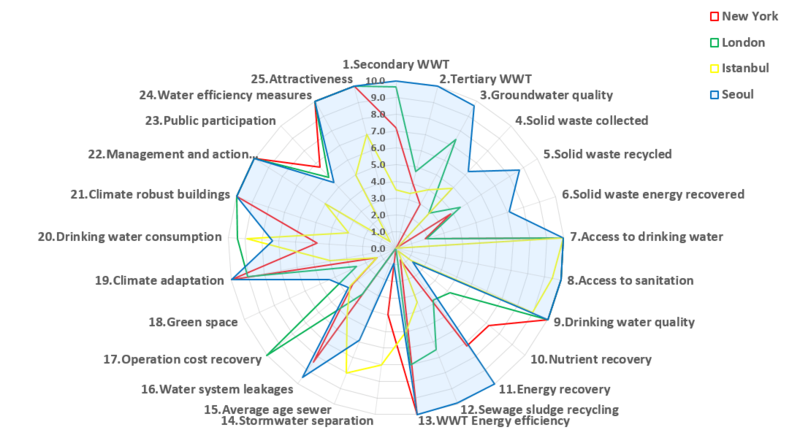 Recently the results of the City Blueprint analysis of Seoul were presented to colleagues in both the Seoul City government and the Seoul Water Institute. The experts involved were Dr. Jeryang Park, Assistant Professor at the School of Urban & Civil Engineering of Hongik University, Dr. Seockheon Lee of KIST (for the City Blueprint and Trends and Pressures analyses of Seoul) and Prof. Dr. C.J. van Leeuwen of KWR (for the review of the results). Comparison of 25 indicator scores between Seoul, New York City, London and Istanbul.